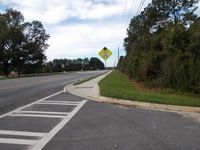 ZEL provided roadway design services for this approximately 9,300 feet of road widening and realignment including storm drainage, sidewalk, curb and gutter, striping, erosion control, and surveying. Drainage design included hydrologic and hydraulic calculations, wetlands and streams impacts, and mitigation. Geometric design included 3D ground surface modeling, as well as vertical and horizontal layout. 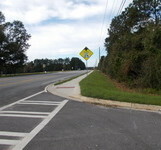 The project included the addition of turn lanes and coordination with another consultant on intersecting road alignments.